What is the MSC Class 2 ? Microbiological Safety Cabinets (MSC) can take three forms, described in International Standards such as BSEN 12469. An MSC Class 1 has an inward flow of air to protect the operator, much like a fume cupboard. A MSC Class 2 also has an inward flow plus a HEPA filtered laminar down flow, to give product as well as operator protection. A MSC Class 3 is a totally enclosed glove box where the operator works through gauntlets. 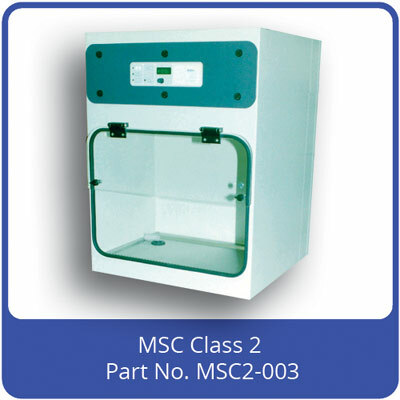 The QAT MSC Class 2 is a very compact safety cabinet designed for small applications or where lab space is hard to find. The MSC Class 2 is ideally suited for any application that requires both operator and product protection. This might include handling pharmaceuticals, potentially pathogenic work or containing allergens. The MSC has a single fan system which feeds a plenum at the top of the cabinet. Air from here passes downwards through a HEPA filter to create the laminar downflow to protect the product. A smaller volume of air passes upwards through the exhaust HEPA filter. This volume of air then enters the front of the cabinet through the working aperture, to create the in flow which protects the operator. The MSC Class 2 is very compact and small enough to be mobile. Its low voltage system - 24 volts DC - make it inherently safe and it can also be run from internal batteries or a commercial vehicle supply. Its simplicity of design also means there are very few consumable parts required making the cost of ownership (as well as the purchase cost) very low.